Our spectators are children aged from 3 to 9 years. The maximum number of children at a performance is 50. Our performances are designed for a relatively small number of spectators so it is easier to connect with the children's performance. 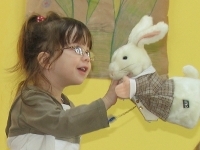 It is also means more people have a chance to shake puppet-rabbit's hand, smell the gingerbread spices or throw woollen snowballs. In many performances we have props (e.g. bells, flowers) which we distribute among children during songs. In some stories they can taste delicious biscuits. Our goal is that children, as much as they are able to, take part in the performance - clap, repeat some words, answer easy questions, do simple gestures, etc. It depends on the children if the lion lets the mouse free or if the dragon takes the medicine which he hates so much. 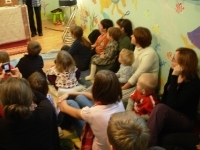 During some stories we ask older children to repeat a sound or phrase on hearing some words. For example, when children hear in a story words Santa Claus they are supposed to say "Ho, ho, ho". The language of our performances is English, however knowledge of the language is not essential. 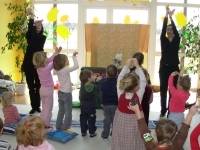 Illustrating the songs and stories with gestures, props and pictures helps understand the content so that children stay focused during the play. At the beginning we make an introduction in Polish. Kindergartens or English-speaking houses are exceptions because we speak English there from the start. In the introduction we shortly explain to the children what the stories are about and how they can take part in the performance. Moreover, we adapt our performances to the abilities and age of the audience. When children have only just started to learn English, we show pictures illustrating the key words at the beginning and during the course of the story we focus on the important words, making a short pause before the word and saying it very clearly. In this case we treat the performance as an interesting alternative to the English lesson. When children know English well we encourage them to speak using whole sentences whenever it is possible.